This figure is of fine quality, the terracotta and paintwork being in excellent condition and finished in soft tones of cream and gold. St Michael is depicted in Classical dress holding a spear in the mouth of the dragon, the dragon representing Satan or the Devil. He is photographed on an octagonal wooden base, finished in a cream paint, which is included in the price. 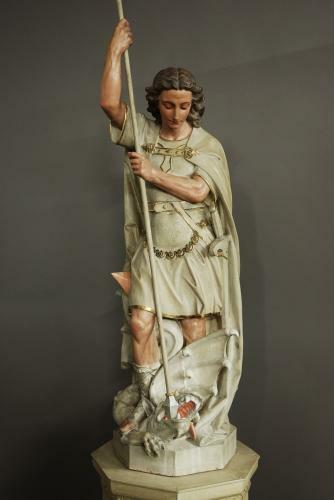 This figure could also be St George slaying the dragon, although after researching we think it is St Michael. This piece is in excellent condition and can go straight into a home.